Under bright sunny skies, the first Poky Pedal of 2015 was a harbinger of all the Bike Fun ahead. 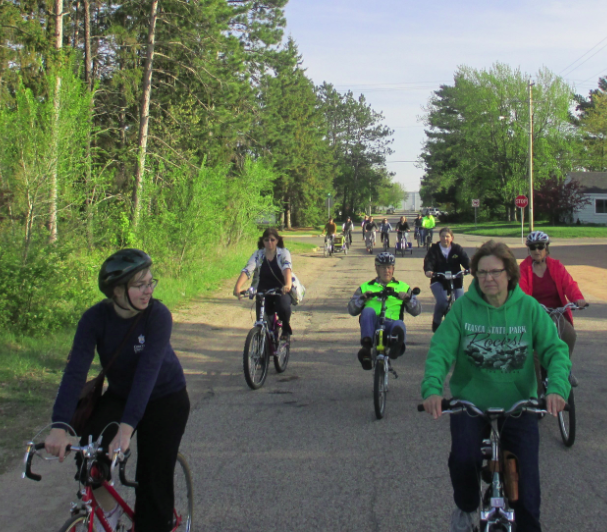 Twenty Poky Pedalers enjoyed a pleasant evening combining bikes, pizza, and more on last night’s Poky Pizza Pedal. Our meeting spot was Point Area Bicycle Service in downtown Stevens Point. John, the talented and cheerful owner and chief mechanic at PABS, had his own surprise for us by holding a drawing among the Poky Pedalers present for a free water bottle that took place just before we started riding. Spontaneous expressions of Bike Fun are most welcome, and I want to thank John for his contribution to our Poky Pedal. That wasn’t the only surprise revealed to Poky Pedalers before the start of our ride. There will be more about this other surprise below. At around 5:30 PM, we started off on a 4-mile bike ride at our typically poky pace. Our route took us southeast of downtown, crossing Clark St and Division St at signalized intersections. We found our way to Center St, which is a particularly charming street to ride with nicely maintained homes, lots of magnificent trees, and very little traffic. We rode most of its length before turning north and then west, ending up on Ellis St for our ride back towards downtown. Ellis is also a great route for Poky Pedalers that goes through an attractive neighborhood and does not experience much traffic. To cross Division on Ellis, we all dismounted and walked our bikes across. Waiting for a break in traffic and asserting our right-of-way via walking makes it significantly easier and less stressful for a large crowd of Poky Pedalers to navigate across such busy intersections. About 45 minutes after we started riding, we arrived at our pizza destination, Kristin’s Riverwalk. This was the second time we visited Kristin’s Riverwalk on a Poky Pizza Pedal. Just like our visit last year, their service and cooperation was wonderful, and their pizza was delicious. Accommodating our large contingent of Poky Pedalers takes some effort, and I heartily thank Kristen and her staff for their role in making last night’s Poky Pizza Pedal a great success. Our Bike Fun transitioned into socializing among Poky Pedalers while partaking in food and drink. As our conversation wound down, our pizza platters grew empty, and our final sips drained our glasses, the first Poky Pedal of the year came to an end. But there is lots more Bike Fun to share ahead, and those who joined us last night took home a small reminder – the other surprise – given out at the start of our Poky Pedal. Last night was the unveiling of PPSP bicycle “bumper” stickers that will be handed out for free to all Poky Pedalers on every Poky Pedal this season. I intend to create a few different sticker designs, allowing Poky Pedalers to transform their bicycles into expressions of Bike Fun for the whole world to notice. These small vinyl stickers are waterproof, and since laser toner is used instead of inks, my understanding is that the colors will be fade-resistant for years. These stickers will be fashionable and fun accessories for bicycles of every Poky Pedaler. The stickers I handed out last night featured an array of images depicting the PPSP logo under the message “Poky and Proud”. This design will be available at the next several Poky Pedals, creating even more incentive to come share Bike Fun. So check out the Upcoming Poky Pedals page to learn of your next few opportunities to share Bike Fun with PPSP and to get your own “Poky and Proud” bike sticker. For the list of all Poky Pedals this year, you can look at the 2015 Bike Fun Calendar. Poky Pedalers will want to rearrange your schedules so as not to miss a single chance to share Bike Fun with PPSP this year.